The New Deal under Franklin Delano Roosevelt (1933-34) attempted to provide recovery and relief from the Great Depression by the establishment of a number of emergency relief programs. Among these the Federal Emergency Relief Administration (FERA) program, the first of his major relief operations, provided state assistance for the unemployed and their families. Rather then having large numbers of workers on the dole, Roosevelt believed in work relief, or payment for work performed, to help maintain the morale of the recipients. Although more costly, this program and others provided work for over 20 million people. The following collection documents FERA projects established in King County. These include street construction, bridge building and sewer laying projects; park grounds and playfield improvements; school and public building construction and repair; land clearing, landscaping, wood cutting and land slide prevention; ditching, dredging, flood control and waterway improvement projects; establishment of FERA offices and stores; creation of recreation projects for children; organization of furniture, stove and tool repair, sewing, clothing distribution, boot and shoe repair, toy-making shops. This database was produced as part of the Crossing Organizational Boundaries IMLS Grant. The results of this grant project are also showcased on the King County Snapshots web site. 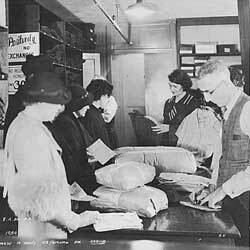 The information for the Federal Emergency Relief Administration Collection was researched and prepared by the IMLS Grant, UW Libraries Special Collections Division, and Cataloging staff in 2002-2003. Not all the photographs from the collection were included in this database: the database consists of 274 digital images chosen from a group of approximately 845 photographic prints. The photographic prints were scanned as a 3000 pixel TIFF image in 8-bit grayscale, resized to 640 pixels in width and compressed into JPEG format using Photoshop 6.0 and its JPEG quality measurement 3.The scanned images were then linked with descriptive data using the UW CONTENTdm program. The original collection resides in the UW Libraries Special Collections Division as the Federal Emergency Relief Administration Collection no. 263.